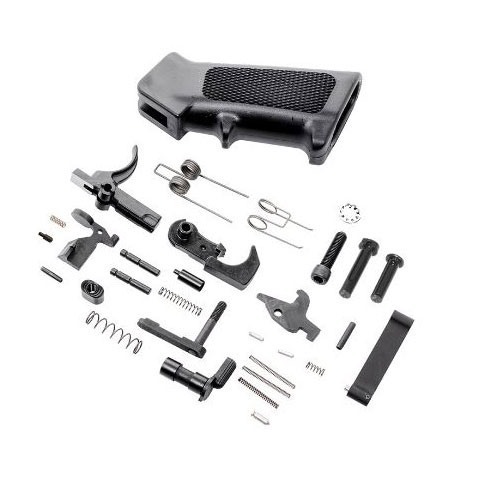 SPECS: Kit includes A2-style pistol grip, trigger, trigger spring, hammer, disconnector, hammer/trigger retaining pins, hammer spring, bolt stop and screw, selector, selector detent, bolt catch, magazine catch, magazine release button, front pivot pin, rear takedown pin, buffer retainer, triggerguard assembly, and all necessary pins, springs, detent and screws. AR-15/M16 fits mil-spec AR-15/M16 lower receivers. Komplett sett inneholder alle interne deler som trengs for å fullføre eller bygge en AR lavere mottaker. Høykvalitets komponenter er utformet for å fungere sammen med hverandre for å sikre problemfri drift, og de leveres i fargekodede poser som organiserer relaterte deler for enkel montering. Inkluderer støpt-polymer A2 pistolgrep, som tilbyr en tradisjonell, ett-trinns 6 til 6½ lb tjenesten rifle trekke Mil-Spec utløser. Spesifikasjoner: inkluderer A2-stil pistolgrep, utløser, utløser våren, hammer, disconnector, hammer/utløse beholde pinner, hammer våren, bolt stopp og skruen, velgeren, velger detent, bolt fange, magasin fangst, magasinet utløserknappen, foran pivot pin, bakre takedown pin, buffer retainer, triggerguard montering og alle nødvendige pins, fjærer, detent og skruene. AR-15/M16 passer mil-spec AR-15/M16 lavere receivere. I found this kit to be out of spec. The mag release button was extremely small compared to others I had. I didn't bother trying to install. I give it one star but is not Brownells fault. I recently installed three of these kits into Seekins Precision lowers and have to say I'm extremely satisfied. These kits went in smooth and have one of the best triggers I've seen in a LPK of this price range. I definitely recommend this LPK if you're doing a basic build. As a first time builder I found this kit easy to use. The color coded groups were very helpful and the parts went together well. The only thing I would have liked to see added to the kit would be the tool for installing the pivot pin detent. I would recommend it to a friend. This kit was easy to install in my 80% lower build. I am amazed by the trigger for the amount I paid. I was eventually going to buy a replacement two stage trigger but not after shooting this one. All parts fit with tight tolerances and work flawlessly. Used the premium lower parts kit in an 80% build. Really liked the color-coded packages, as they not only positively identified each pin and spring, but helped keep parts in logical build order. Went together nicely UNTIL I noticed that the bolt catch pin was NOT a roll pin (that type of non-roll 'roll pins' have given me fits other times), so did not use it in the build. The extended/ambi bolt catch I used came with a REAL roll pin so that's what was used. I also had a Brownell's roll pin on hand as inexpensive "frustration insurance" but it wasn't needed this time. It's a nice kit with all the parts separated in color coded plastic bags. One issue I ran into was with the safety selector detent spring. It's so strong that after the installation, it would require a wrench to turn the selector. I had to cut two coils off the spring to make it fit correctly. Produsentnr. : 55CA6C5 852005002080 Komplett sett inneholder alle interne deler som trengs for å fullføre eller bygge en AR lavere mottaker. Høykvalitets komponenter er utformet for å fungere sammen med hverandre for å sikre problemfri drift, og de leveres i fargekodede poser som organiserer relaterte deler for enkel montering. Inkluderer støpt-polymer A2 pistolgrep, som tilbyr en tradisjonell, ett-trinns 6 til 6½ lb tjenesten rifle trekke Mil-Spec utløser.